This is one of the hardest boulder problems in the US and Daniel Woods checked in with us after making the second ascent. Last night was a surreal moment for me. 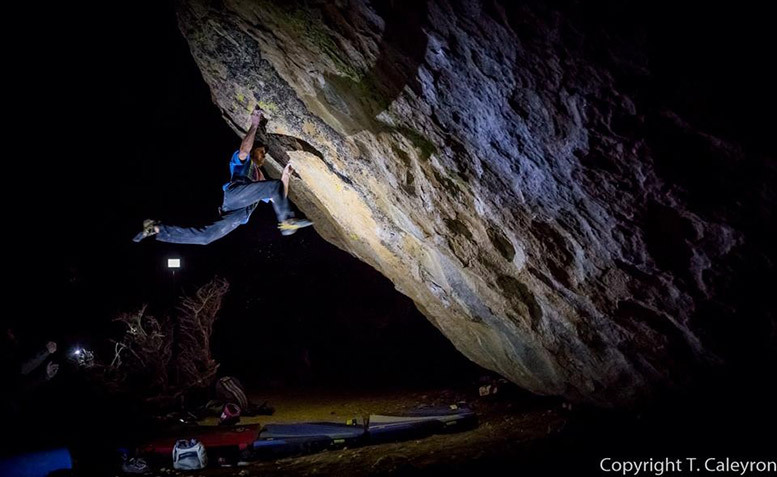 It was pitch black out with a couple lights shining to light up the golden pathway of Paul Robinson’s Lucid Dreaming (v15). The humidity and cold combination was just right to be able and stick to the glassy non-existent holds. I had a nervous feeling in my stomach about what was going to happen if I got through the crux section and had to commit to the final 30 foot slab section in the dark (I did have a headlamp for the slab). Luckily, I had an amazing support crew to help me stay in the zone. I blasted my beats on my Goal Zero rockout 2 speaker, chalked up and set off. Every move felt perfect and before I knew it, I was on top of the Grandpa Peabody boulder for Lucid’s 2nd ascent. This line is stunning, aggressive, and committing. Props to Paul for linking these moves together and creating this epic test piece. Uncut video footage coming soon by Kyle Berkompas @Cff_climbing.